happy friday! let’s eat cupcakes! hey los angeles! i just wanna update you with one more place in this town you can get vegan cupcakes, cake and art on santa monica blvd in west hollywood. to be honest, until recently i didn’t know this place existed. 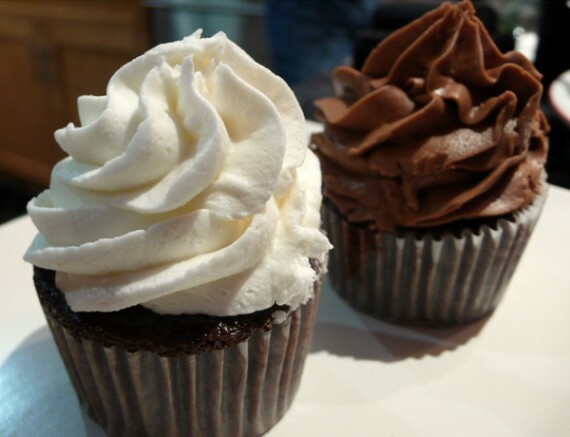 their website doesn’t even advertise vegan cupcakes, but they carry both a chocolate and vanilla flavor that are delicious. last week i had some friends over, and one of my vegan homies showed up with a box of mini cupcakes from cake and art. the moist little cakes were topped with loads of rich creamy frosting, and they were so good that we all stood around the kitchen fighting over them until not a crumb was left. i live pretty close to west hollywood, so it’s pretty dangerous knowing this place is around. a shop where i can stroll in off the street and get cupcakes this good is bound to lead to disaster.